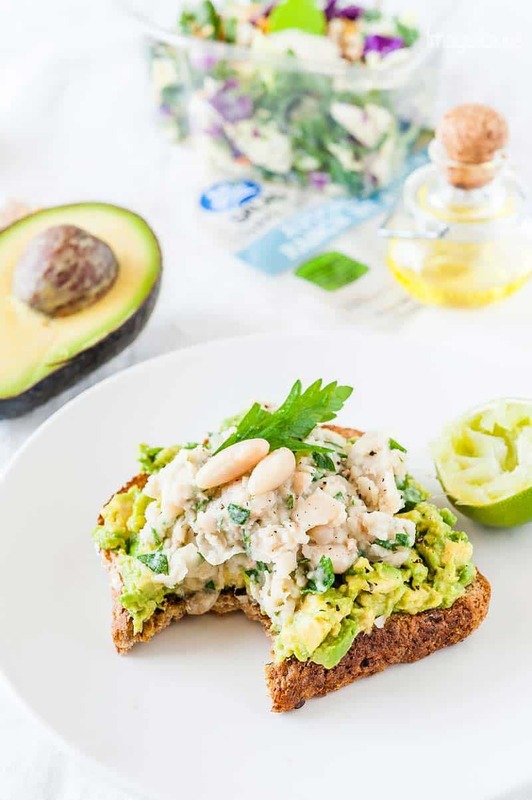 Avocado-White Kidney Beans Toast is a delicious and healthy breakfast, lunch, or even light dinner. It comes together in a matter of minutes and keeps you full for hours. Perfect for any time of the year and easy to make. Pair it with Eat Smart Salad and you have a complete meal! Staying home with the baby has a surprising perk of long and delicious breakfasts. Morning time is when baby is in her best mood. I boil water for a big pot of coffee, make Apple-Banana Fritters or Banana Pancakes or Full Breakfast or any other breakfast that my belly desires and enjoy the morning. Dinners also usually involve real food and some tv on the background. Lunches, on the other hand, are much more difficult. More often than not I have deconstructed sandwiches for lunch – a piece of soggy toast crammed into my mouth, followed by a slice of cheese an hour later, and maybe a tomato if I am lucky an hour after that. So, for lunches I like to keep things super simple, easy, and fast. And that often means relying on pre-made ingredients. I’ve been buying Eat Smart Salad Kits at Costco for many years. Sweet Kale is the one that is perfect to serve at dinner parties – it’s elegant, healthy, delicious. My best friend who doesn’t have Costco membership asks me to buy her that salad a few times a year because the size is bigger than what you get at a regular grocery store. Eat Smart is committed to have all their products be free of artificial colours, flavours, and preservatives by the end of 2018. 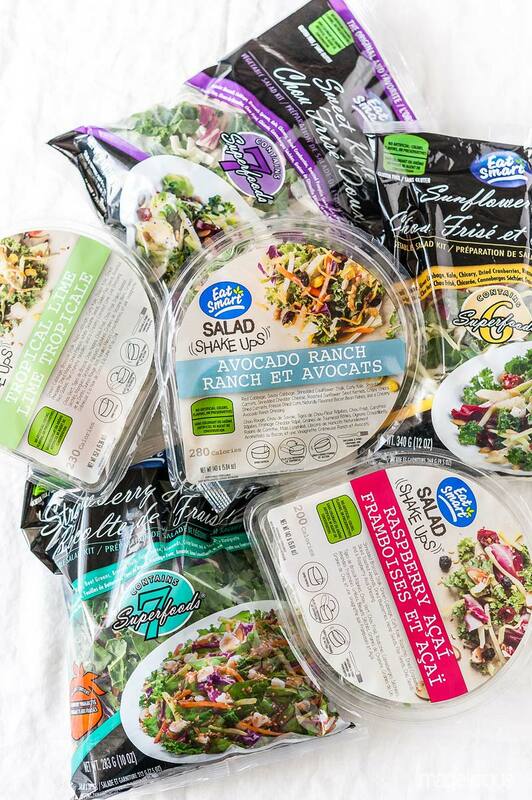 And almost all of the salad kits and new shake ups already have clean label which means they are free from high fructose corn syrup, hydrogenated fats, artificial flavours, colours, sweeteners, and preservatives. So, I feel really good serving these salads to my family and eating them for lunch when my life gets crazy. Eat Smart salad shake ups were only launched recently and they are great for lunches on the go. Not only they are healthy and delicious, they also feature a very convenient lockable lid that makes mixing (or shaking) the salad very easy. There’s also a fork, separate dressing container and small packets of mixings. My favourite is Avocado Ranch! 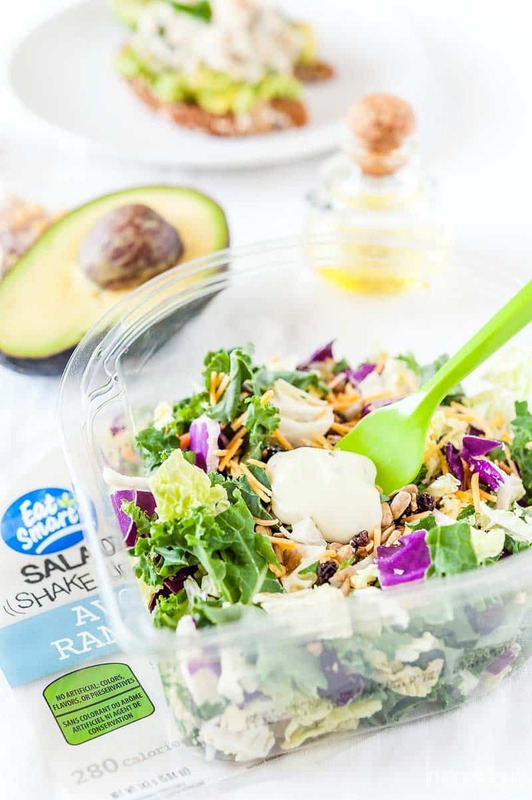 It’s really delicious and creamy with the perfect balance of flavours and textures – crunchy toppings, cool dressing, cheese, kale, what not to love?! For more information subscribe to Eat Smart monthly newsletter under “Receive Exclusive Offer” on their website. 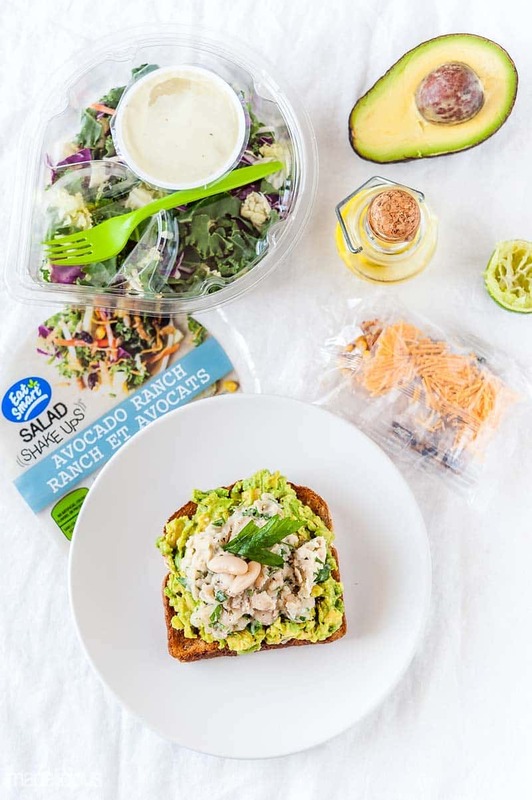 Eating an Eat Smart salad and a quick Avocado-White Kidney Beans Toast is my version of ideal lunch. It keeps you full for hours without any additional snacks. The toast is really easy to make and the addition of mashed white kidney beans is what makes it filling. Making it is really easy too. 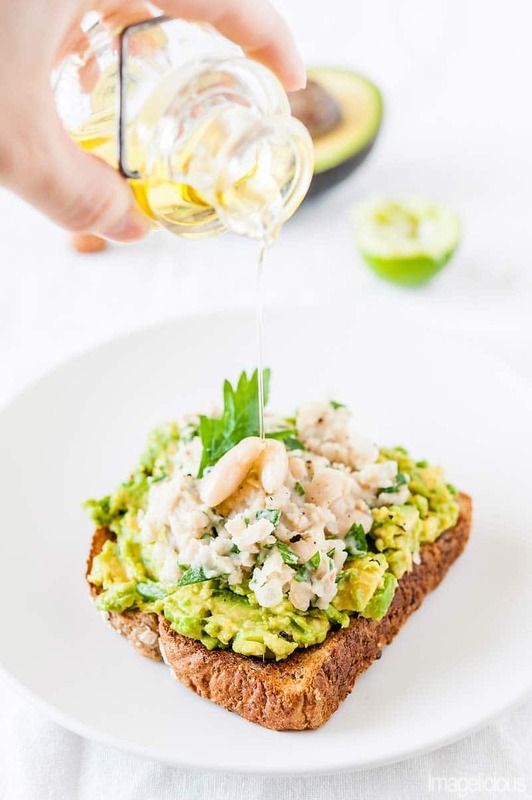 Just roughly mash half an avocado with some salt, pepper, and lime juice (or lemon if you prefer), spread on multigrain toast, and add fork-mashed white kidney beans mixed with chopped parsley, salt, pepper, olive oil, and more lime juice. Avocado provides plenty of good and healthy fats (use the second half for my favourite dessert Avocado Banana Chocolate Pudding). Multigrain toast and beans have fibre. And together they make one delicious Avocado-White Kidney Beans Toast. Here’s a secret: add a soft poached egg to the toast and you have an amazing breakfast! Toast a slice of multigrain bread. In a small bowl mash with a fork half an avocado, juice of lime to taste, salt and pepper. In a separate bowl mash with a fork 1/3 cup of drained and rinsed white kidney beans. Add a teaspoon of olive oil, chopped parsley, salt, pepper, and a bit more lime juice to taste. 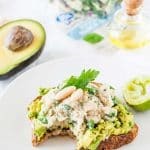 Spread avocado mash on the toast. Pile white kidney bean mash on top. Sprinkle with more salt, pepper, a squeeze of lime juice and a drizzle of olive oil. Love white kidney beans! They make a great alternative to chickpeas for those who don’t like them. And avocado toast is ALWAYS a favourite! Oh wow what a gorgeous toast!! It sounds delicious! What an awesome idea for lunch. I love this. Ooooh, this sounds like a fantastic lunch! Love all the different ingredients and textures and flavors! I can’t wait to get this on my lunch menu soon! I do want to eat smarter but I do not want to give up flavor. This sandwich would be a perfect start. It has flavor and texture. This looks fabulous! I love avocados and this is a great way to eat it! Thank you so much!! I love avocados too!